The Irish premiere of the stunning NYsferatu: Symphony of a Century, directed by Andrea Mastrovito, an animated interpretation of the classic 1922 horror film Nosferatu, , with a live score specially commissioned for Bram Stoker Festival by Matthew Nolan. 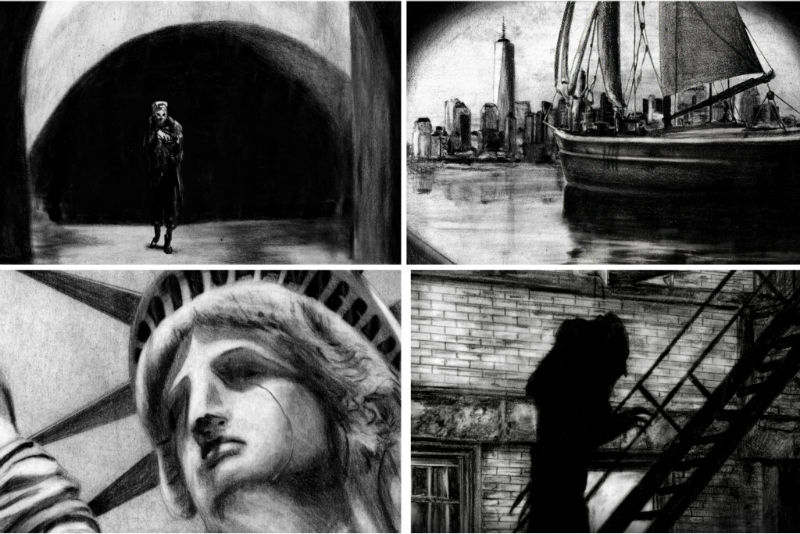 Set in present day New York City, NYsferatu: Symphony of a Century turns the original film on its head, positioning the vampire character as that most contemporary of “outsiders” – an emigrant escaping war at home only to face economic exploitation and xenophobia in their new country. Rich with symbolism and political commentary, the film retells the story of the vampire through the lens of modern-day fears about Islam, immigration, and refugees. The rotoscoped film, comprised of 35,000 hand-drawn images, replicates the eerie, flickering shutter effect of early cinema and will be accompanied by a specially commissioned live score by internationally renowned composer Matthew Nolan (Ireland), with similarly celebrated international musicians Erik Friedlander (U.S.A), Sean MacErlaine (Ireland) and Jan Bang (Norway) at St. Anne’s Church, Dawson St, where Bram Stoker married Florence Balcombe in 1878. The Arts Council of Ireland and Bram Stoker Festival supported the commissioning of a new score by Matthew Nolan for Andrea Mastrovito’s innovative feature film NYsferatu, which will premiere at Bram Stoker Festival 2018. Also supported by Goethe-Institut Irland. Supported by Goethe Institut Irland. All attendees aged 21+ are welcome at Sam’s Bar, 36 Dawson St (across the street from St. Ann’s Church) for a complementary ghoulish cocktail after both performances on presentation of your e-ticket. This event is complimented by a panel discussion on Saturday at 1pm entitled ‘Xenophobia and the Vampire Myth’ with special guests including Director Andrea Mastrovito. NOTE: This show is not suitable for young children; people aged 14+ will be admitted with a guardian. Venue is wheelchair accessible. If you have accessibility requirements, please contact our team on info@bramstroker.dream.press before purchasing a ticket.